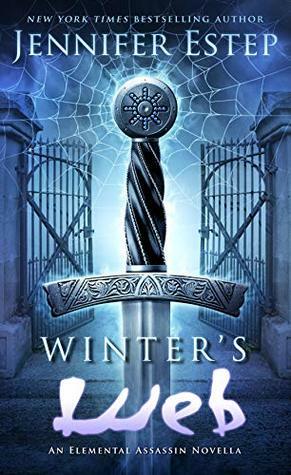 A Scandal in Battersea by Mercedes Lackey | Books, Movies, Reviews. Oh my! Thirteenth in the Elemental Masters alternate history urban fantasy series for young adult readers and revolving around two young women who use their magic for good. It’s set in Victorian England at Christmastime. An interesting tale that took a long time to tell. It got rather tedious as Lackey went on and on about the perverse Alexandre. There are a few referrals to his, um, preferences, but nothing that should be negative for ages 16 or 17 and up. I’d say that the younger kids probably already know about this, but…what do I know. The story reads well and easily even though Lackey uses third-person point-of-view from only Nan’s perspective. Seeing as the girls are joined at the hip, I’d’ve thought a dual POV using both Nan and Sarah would have been practical. No matter, though. There’s really nothing new about the core characters — except for Lord Alderscroft. I did enjoy his letting go at the panto. The theme is the age-old one of good triumphing over evil. I suspect “knowing” the eventual outcome added to the tedium. Don’t get me wrong. It was an interesting story, and it does progress the series arc a touch. I did appreciate the goodness of the core characters, so in that respect, it does set a very good example. It begins with Lord Alderscroft asking Nan and Sarah to help John and Mary Watson scour the asylums of London, for those who have been declared mad because no one understands their budding magical abilities. What they haven’t taken into account is that it’s Christmas, and Christmas Eve is also hallowed to dark forces, powers older than mankind, powers that come awake on this, the Longest Night. Powers best left alone. Powers that could shake the foundations of London and beyond. It begins slowly. Women disappearing in the dark of night, women only missed by those of their own kind. The whispers only begin when they start to reappear — because when they do, they are no longer sane. And when Nan and Sarah and the Watsons are called on to examine these victims, they discover that it was no ordinary horror of the streets that drove them mad. But then, the shadows reach for other victims — girls of good, even exalted families, who vanish from concerts, lectures, and performances. And it will take the combined forces of Magic, Psychic Powers, and the world’s greatest detective to stop the darkness before it can conquer all. Nan Killian (she transforms into a Celtic Warrior) and Sarah Lyon-White are best friends and roommates, who happen to have magical powers. Each has an avian companion: Neville, a black raven, is partnered with Nan while Grey, an African parrot who transforms into a large hawk, is partnered with Sarah. The young Suki is their ward, a medium of great potential power. Mrs. Horace is their landlady. Dr. John and Mary Watson are friends and live above Sherlock Holmes on Baker Street. Billy is one of the Baker Street Irregulars. Mycroft Holmes is Sherlock’s brother and has the ear of the Queen. Sergeant Frederick Black commands the special platoon. Puck, a.k.a., Robin Goodfellow, is the Oldest Old One in England and their friend who has given the girls a talisman. 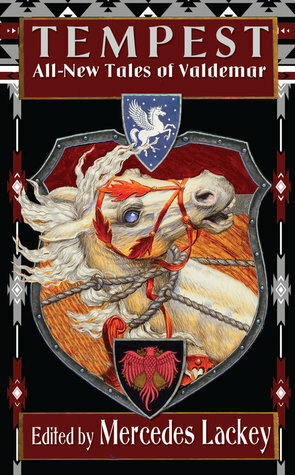 Durwin and Roan are hobs assigned to the girls by Robin to act as protectors and messengers. The Wild Hunt is led by the Huntsman who determines for himself who is fair prey. …a school for the children of expatriates and those with magical abilities. It’s headed up by Mems’ab Harton (sports a very short Grecian tunic and spear) and her husband, Sahib Harton (who turns into a medieval knight), who has installed a manager for his import business while Sahib takes on instructing. Karamjit, Agansing, Selim, and Gupta — Sikh, Gurkha, Muslim, and Hindu — are protectors and experts in the mythology and magic of their respective regions. Mustafa is one of the servants. …where the wealthy send relatives who act “funny”. Dr. Huntley runs it, without being too conscientious. Amelia isn’t mad, but does experience prescient dreams. …led by Lord Alderscroft, the Wizard of London and Fire Master, who loves indulging Suki’s sartorial love. Graves is his butler. Brendan is his coachman. …the unfortunate Maisie who objected to his sexual demands. Elizabeth Penwick had been going to fetch fish and chips. Cynthia Denniston, a niece of Lord Denniston, had been visiting the Grosvenor Gallery with a group. Katherine Dalton was attending a performance of Hamlet with a very bad understudy. Alexandre Harcourt is a selfish, perverted, murdering sociopath who always wants the easy way. He believes he would be a Water Magician. Alf is his extremely obliging, perverted servant. Victor is the brother who would have inherited it all. His father and mother, Emily, never got over their grief. Arthur Fensworth is a lawyer and had been a friend of Harcourt Senior and is quite dutiful in adhering to his bequest that Alexandre pursue a useful “career”. Young Abernathy is the current head of the law firm, Abernathy, Abernathy, and Owen. The tentacled entity promises much and demands even more. …artists and writers of whom Beatrice Leek is one who interacts with Earth Elementals. Caprice “Cappy” is Beatrice’s black cat. Hobson is a brownie who works for Beatrice. Treadman’s Books specializes in the rare, the occult, the esoteric, the profane, and the obscene. Maudie is an old lady and neighbor of Nan and Sarah’s who’s been ailing for months. Grannie Toscin, a neighbor of Harcourt’s, lives with and helps care for her granddaughter Jilly’s babies while Jilly is out housecleaning. Madame Maud holds virgin auctions. 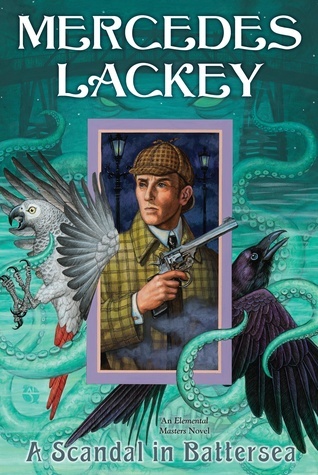 The cover appears to be an underwater scene with its blue green drifts of color overlaying the tentacles that writhe around the braking parrot, Grey, on the left of the purple and pink bordered graphic insert of Sherlock Holmes (in his trademark deerstalker hat and checked coat) carrying a long-barreled gun with the raven, Neville, soaring upwards from behind the righthand corner. The author’s name is in an embossed white gothic script at the top while the title is much smaller at the bottom in an embossed white-outlined black. The series information is very tiny just above the right end of the title. The title refers to the Victorian horror of scandal, for what happens to the girls, for what Alexandre gets up to, for the invasion of England, and it is A Scandal in Battersea. I’ve not heard of this series and I do enjoy some urban fantasy. Thanks for sharing it. You are most welcome, Laura. It’s a fun series…the earlier books were much funner *grin*, but it’s an interesting merge of magic, societal and cultural mores of Victorian England, Sherlock, and two young ladies trying to cope. 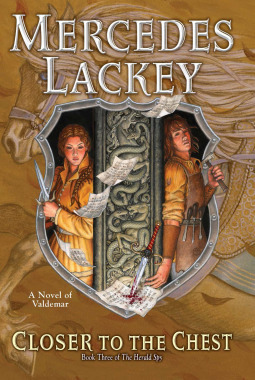 I haven’t read anything by Mercedes Lackey yet but I do hope to at some point. I don’t know that I would start with this one. What do you feel has attracted you to Lackey’s work? She’s got tons of series out there and they range all over the place.